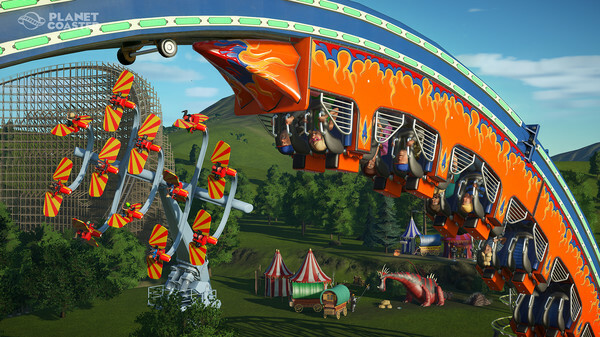 In Planet Coaster, you can load thousands of creations from the Steam workshop and place them in your park. If you want to be creative, you have endless possibilities. This wide range of construction possibilities can also really overload you at the beginning. This is why we want to give you some useful tips on building and managing your theme park in Planet Coaster. Before you start playing and open your own park, we recommend starting the Career mode. Of course, you can also watch the tutorial videos. In Career mode, parks are already built. You get tasks that you must fulfill to collect stars. The more stars you get, the faster you get on the level. If you increase this again, more career sceneries will be unlocked. You start with a pirate park, then you will find yourself in a magical fairy tale world, which is replaced by a technical and scientific park. In the end, you can feel like kings and try the aristocratic theme park. In career mode, you don’t have many objects to choose from. At the beginning you can not build your own roller coasters. Although there is no "real" tutorial, but you get note boxes as soon as you start various actions. Disable them when they annoy you. Your most important window is at the bottom left of the bar. Under Park Management you will find everything you need - at a glance. Click through the riders to see if your employees are happy, what your guests think, how your finances look, and especially if you can explore something new. Especially the research is important, if you want a varied and varied park with many attractions. But it costs you money every month. The more money you invest in research, the faster you get the result. Depending on the rides you offer, you are attracting a certain target group. Some roller coasters are only designed for one target group. So take the mouse over the rides to learn more about them. In the beginning, you only earn money with your attractions in the park. The entry is usually set to 0 $. You can of course also adjust this in the park management. The family price is only for one person in the family and should be slightly less than the normal entrance price, if you want to attract more families. Consider that this target group has a lot of money and wants to spend it. The park rating is your best advertising. If the park evaluation continues, more and more visitors will come to your park. It depends on many factors. Just go left on the number to the right of the star symbol. Here you can see everything you need to know. The rating increases when your guests are happy, your employees like to work in your park, and the rides also fit well into the respective theme area. If you build a new attraction, you should look in the overview page of the driving business, how much it fits the environment. You can see this from the percentage at the bottom right. If the number is low, you can place around trees and decorations. - Make sure the ride is full before it starts. - To increase this effect, you should click the check mark at the minimum wait times. This allows the operator of the attraction time to start it when it is really full. - But be careful to set a maximum waiting time so that other visitors don’t wait too long in the queue. - Get more wagons on roller coasters. This is easy for you: Simply place blocks on the tracks where a car can stop and the next one can start. - Rides can be quite simple: New visitors are only allowed to enter the attraction when the guests who have just driven with them - all have left the ride over the exit of the ride. So build the exit in the middle of the wagons, so that people can go out faster. Your employees should also be important. If they are happy, they serve the guests faster and hardly miss out on orders. If they are again unhappy and will not take breaks, you will also be less likely to take some guests. To keep your employees happy, you can improve them every two months. So they climb up the level. They will not only be happier, but also work more effectively - but they also want more salary. So remember that you should give your employees a raise on each level-up. If they have less to do, their mood decreases slower. If they have too much to do and need breaks, you should build more shops and adjust work schedules. If you increase the prices in a store, they are not automatically changed in all stores of the chain. Consider this in the case of price increases or decreases. - If you want to create perfect curved paths, click on "Select grid" at the bottom right of the path menu. Now a grid opens on the way and you can place the paths one after the other. - If you build shops, you can build buildings around them. Place walls and roofs around the shop. - If you want to rotate an object by 45 degrees, press Y once. Hold Y and rotate with the mouse to fine-tune the object. - First click through all objects. On the left you have two riders. In both riders there are partly different objects and categories. - If you want visitors to walk on your buildings, you have to build additional paths on the house.